According to mythology, Zeus released two eagles at opposite ends of the world and they met at Delphi, making it the ‘center of the world.’ Because I already had been to ‘the center of the world,’ I stayed aboard reading When We Were Yours and writing a long letter to Rick. Gretchen, the sponge of travel headed off for Delphi. Gretchen’s notes: “Beautiful little town. The drive up to Delphi took us through 4.4 million olive trees (Greeks consume about 6 gallons of olive oil per person, per year). We also drove by ancient aqua ducts, used to this day. 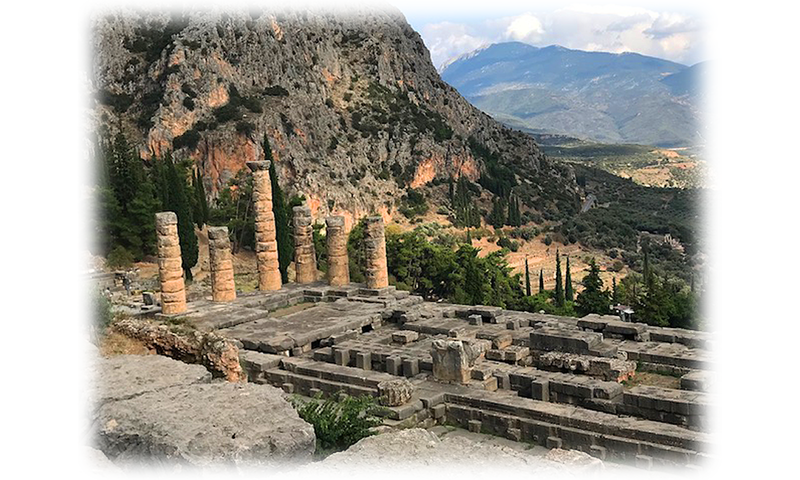 Dating back to 1400 BC, the Oracle of Delphi was the most important shrine in all Greece, and in theory all Greeks respected its independence. Built around a sacred spring, Delphi was considered to be the omphalos - the center (literally navel) of the world. People came from all over Greece and beyond to have their questions about the future answered by the Pythia, the priestess of Apollo. And her answers, usually cryptic, could determine the course of everything from when a farmer planted his seedlings, to when an empire declared war. No table for two! Command dinner with the ship’s doctor and 2 couples, both connected to medicine. Actually good conversations, we got to hear about some challenging surgeries, and health care in the Philippines. Gretchen, of course, bonded with the couples. We had a surprisingly nice time. Afterwards, Cointreau over chipped ice, and then early to bed again.